It is very important (and mandatory) for industries to achieve the Fire Safety Regulations for Industrial Establishments, which establishes the minimum requirements to be met by industries and warehouses for safety in case of fire. Fire safety in industrial establishments helps inspections, detail the methodology to be followed by safety inspections and establishes the actions to take if there are deficiencies in the installation or in the maintenance measures. July 7th. Andujar. Fire destroys 3 ships, property damage and 50 workers cannot work. July 5th. Algemesí. industrial fire in an oil company in Algemesí whose ship has been scorched by the flames. June 27. Esperraguera. 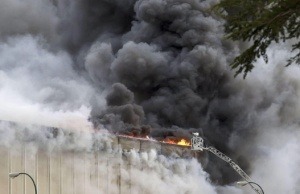 Fire destroys a warehouse in Esparreguera. There has been “just” one injured worker. June 9 Navalmoral. Industry fire in the industrial area of ​​Navalmoral de la Mata (Cáceres) which has been “completely destroyed”. June 5th. Alcala de Henares. A fire has destroyed seven ships of an industrial complex. May 21th. Velilla de S. Antonio: Three industrial buildings in the city of Velilla de San Antonio, southeast of Madrid, have been seriously damaged after a fire. may 14. Seseña. The fire that ravaged the biggest tire dump in Europe took 4 weeks to completely shut down, and it is the largest to date in Europe. Its toxicity has forced to evacuate the population in the surrounding area. May 9. Moaña. Serious fire that destroyed one of the ships in a meatpacking industry in Moaña. Population has been because of a chemical contamination (ammonia). Losses rise up to 14 million euros, and 100 workers can not return to do their job at the company. · Each year there are about 60,000 fires in industrial enterprises. Their aggregate cost rises up to 369 million. · Insurance companies operating in Spain each year disbursed 848 million euros to compensate the losses in industrial companies.